Click on the picture to LOOK Inside the book! Teach your 4-7 year old the alphabet and the letter sounds, then begin sounding out words in specially written illustrated stories. Synthetic phonics lessons have never been so much fun! Children love the humorous stories and color illustrations. 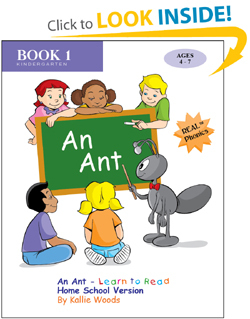 "An Ant - Learn to Read" includes everything you need to teach a child to read. No teaching experience or prep time is required, just follow the on-page instructions and have fun! You and your child will enjoy reading from the same book together. There is no need for any additional materials, but you can always order an extra set of flash cards to keep in the car or at Grandma's house. Book 1 Includes 97 full-color illustrated stories for beginning readers. You will teach your child the alphabet, short vowel sounds and the most common consonants. Your beginning reader will be very proud to receive his or her "Certificate of Achievement" at the end of Book 1, which certifies a knowledge of 96 new words. Book 2 is a continuation of Book 1, teaching the long vowel sounds, more consonants and various consonant blends. The familiar characters from Book 1 continue their humorous antics as your child learns to read 155 new words. An Ant - Learn to Read guides you every step of the way with teacher's notes included on each page. If you can read, you can teach your child to read with phonics, even if you have never learned phonics yourself. Teaching phonics has never been so easy.